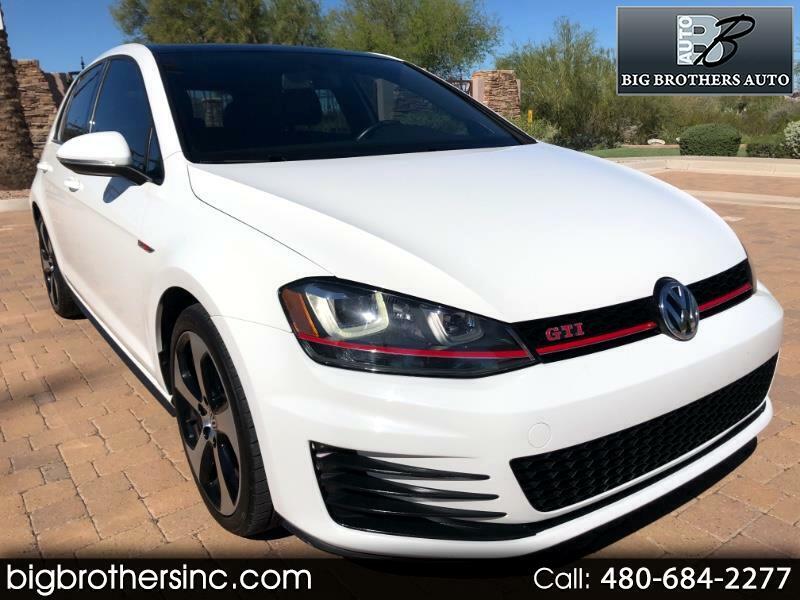 You are viewing the latest addition to our fleet, a 2016 Volkswagen GTI 2.0 Turbo with a 6 speed manual transmission. This car comes equipped with many options including, Power Sunroof, Heated Leather seating, AM/FM/SAT radio with bluetooth and Fender speaker system, Apple Carplay, Auto power windows, power locks, Push button start, Alloy wheels, cruise control, back up camera, Automatic Headlights and much more! If your looking for an almost new condition GTI for thousands less than the competition, then come down and take a look at this immaculate car. This vehicle does come with a branded title due to a very minor rear end collision. The only damage was to the rear bumper and lower tailgate. No airbags deployed and no frame damage. It has passed the Arizona dmv level three inspection process. We have also put this and every one of our cars through an extensive multipoint inspection to ensure all of our customers receive a turn key used vehicle with no worries. If you would like to see and test drive this or any of our vehicles, please contact John on his direct line at 602-684-0202.